UPDATED: Mon., June 18, 2018, 12:34 p.m.
SANAA, Yemen – The U.N. spokesman said on Monday that tens of thousands of residents have fled the fighting along Yemen’s western coastline where Yemeni fighters backed by a Saudi-led coalition are engaged in fierce battles with Iranian-backed Houthi rebels. Stephane Dujarric, the spokesman for the U.N. Secretary-General, told reporters on Monday that about 5,200 families, or around 26,000 people, have fled the fighting and sought safety within their own districts or in other areas in Hodeida governorate. “The number is expected to increase as hostilities continue,” he said. Emirati troops, along with irregular and loyalist forces in Yemen, have been fighting against Houthis for Hodeida since Wednesday. Coalition warplanes rained missiles and bombs on Houthi positions near Hodeida airport, in the city’s south. 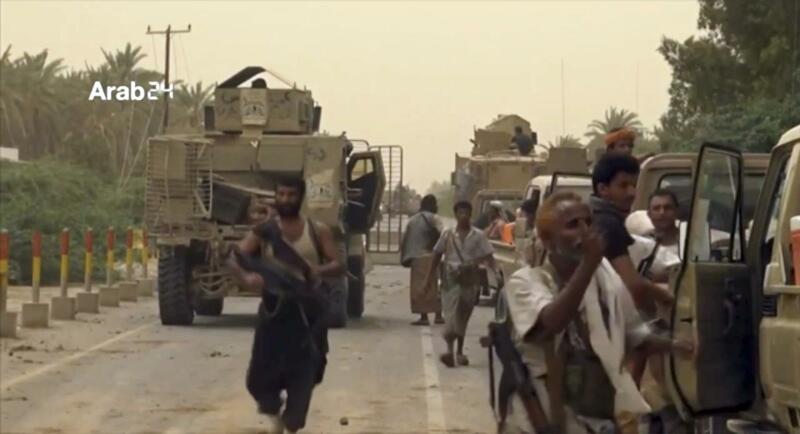 The offensive for Hodeida has faced criticism from international aid groups, who fear a protracted fight could force a shutdown of the city’s port and potentially tip millions into starvation. Some 70 percent of Yemen’s food enters via the port, as well as the bulk of humanitarian aid and fuel supplies. Around two-thirds of the country’s population of 27 million relies on aid and 8.4 million are already at risk of starving. Dujarric also said that U.N. Special Envoy in Yemen Martin Griffiths will be giving a briefing to the Security Council from Sanaa. Griffiths arrived on Saturday and aims at avoiding an all-out-assault in Hodeida. The campaign to seize control of Hodeida threatens to worsen Yemen’s humanitarian situation, as Hodeida’s port is the country’s main entry point for most humanitarian aid. Meanwhile, witnesses said that Yemen’s Houthi rebels have shelled a village in the center of the country, killing at least eight civilians and wounding 15. Residents said that the rebels bombarded the Haglan Maris village late Sunday, and that most of the dead belong to one family. They spoke on condition of anonymity because of security fears. Published: June 18, 2018, 12:33 p.m. Updated: June 18, 2018, 12:34 p.m.